Share projects to collaborate with your coworkers. We support working in teams by making collaborations between coworkers on projects possible. After the first deployment, you are able to add team members to your project via their email addresses. They will be notified with an email and gain immediate access to the project. 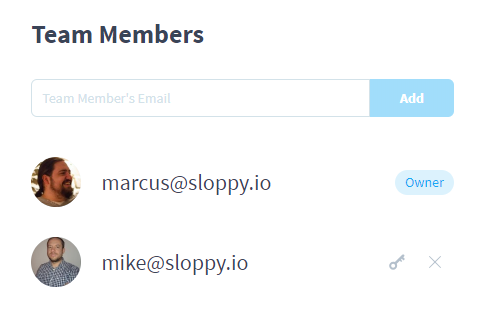 Team members need a sloppy.io account. Members added to the project can be removed or the ownership of the project can be transferred to them. For this, you have to stop the project first. Again, both will be effective immediately. The new owner needs to have the "Business" hosting plan. When not being the owner of the project, you can remove yourself as a team member. When you make use of the token for example in a CI/CD pipeline the token of the account owner needs to be used! Be careful: while not being allowed to delete the project as a whole, team members are able to add, alter, and remove services and apps of the project. They are also allowed to add other team members and remove everyone but the owner. Removing yourself from a project and transferring ownership to another member is irreversible for you and may require changes to the configuration. You can access the team members administration by clicking the plus icon in the dashboard view or detail view of the project. If you are the owner of the project, you can transfer the ownership of the project to an added user, otherwise only the remove icon appears. The project view on the dashboard shows the owner first and then two team members. 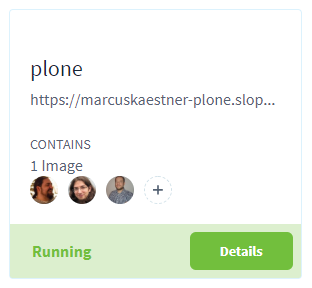 Clicking on the plus symbol accesses the team members administration. The team members administration lets you add or remove team members. When you are the owner of the project, you can transfer the ownership using the key icon.